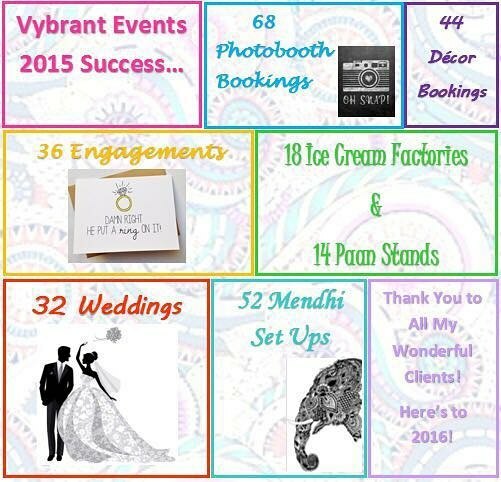 So 2015 has come to an end and it has been such an amazing success for Vybrant Events. We have met the most lovely couples and clients along the way, and it was a pleasure offering our services to you. Now that 2016 is upon us here at Vybrant Events we have a few new things up our sleeve. Over this coming year we will be launching new services and pushing the boat out on the old to ensure we create amazingly everlasting creations for our clients. So stay tuned and keep a look out for the new things ahead. Nevertheless, I would like to say a big thank you to my wonderfully amazing clients for making Vybrant Events 2015 a success! Here’s to another beautiful year, bring on 2016! ← Just another weekend in June! Just another weekend in June!